on this page you will find information about the background, the aims and methods used in the PredictAble project. You will also find information on how to participate if you are interested in taking part in one of our studies. Our research would not be possible without the children and their parents who are willing to give us a bit of their time! The acquisition of spoken and written language is one of the most important developmental steps in children, but not all acquire these capacities easily. Estimates suggest that about 6 to 8% of children suffer from Specific Language Impairment (SLI), a disorder in language development with no known cause such as general cognitive delay, hearing impairment, brain damage or deprived social circumstances. Furthermore, 3 to 10% of children suffer from Developmental Dyslexia (DD), a specific disorder in acquiring fluent reading and writing skills. Traditionally behavioural pencil-and-paper tasks have been used to diagnose children with language-related problems, but these can hardly be reliably applied before the age of 3 years. Moreover, so far research on language related disorders has mainly focused on monolingual children, despite the majority of Europeans are bilingual. 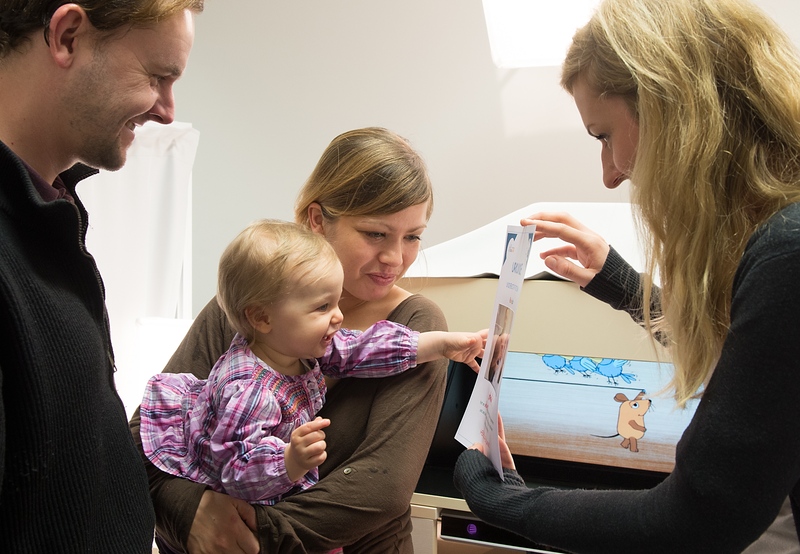 The main goal is to identify individual performance patterns in order to predict and diagnose developmental language disorders such as SLI and DD as early as possible. In total, one technological and four scientific Host Institutions from four countries (Germany, Finland, France, Spain), together with several Partner Organisations are colaborating. 15 Early Stage Researcher (ESRs) work in close collaboration with each other and with the experienced researchers of the host institutions. Word learning and comprehension, as well as early reading fluency, are measured by classical behavioural methods combined with direct measures of neural activity (EEG, fNIRS) and eye-tracking that may reveal linguistic competencies at an earlier age than behavioural measures. Speech production is measured by ultrasound imaging (see picture below), video tracking and acoustic recordings. 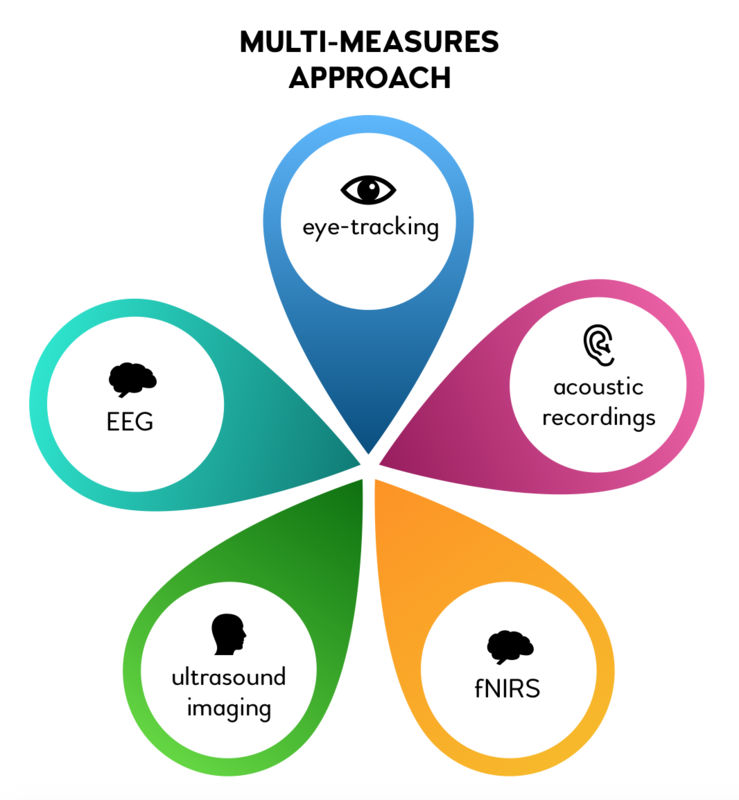 All methods used are non-invasive and free of any known risks for the participants. All experiments are run in a child-friendly environment by researchers who are trained in and experienced with working with young children. The time the studies take is also adjusted to the participating children’s age. Who will be part of the research? We welcome children between the ages of 8 months and about 8 years of age (2nd graders, exact age depending on the local schooling system). Depending on the study, children will listen to unknown sounds, play with toys having exciting new names, or watch interesting videos. The studies also include children with an enhanced risk of SLI (indicated by low productive vocabulary at the age of 2 years or by affected family members) and children with a family risk for dyslexia (as indicated by affected family members). They will be compared to groups of children with average and exceptionally high vocabulary at age 2 or without family risk, respectively. By also including multilingual children we will be able to characterize the specific development of the multilingual language system. If you are interested in having your child(ren) participate in our studies, please fill out the information below. We will contact you when a study becomes available that your child may be eligible for. Registering does NOT obligate you in any way. All information is collected and stored according to the Data Protection Law of the federal state of Brandenburg. Thank you very much in advance!